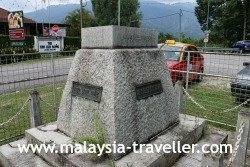 Taiping Heritage Trail - Tips on what to see. 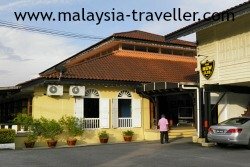 Welcome to Malaysia Traveller's self-guided Taiping Heritage Trail, the best way to experience the highlights of Taiping, Perak’s most historic town. The trail provides an extensive list of what to see. Watch this short YouTube video slideshow for a taste of what is to come. 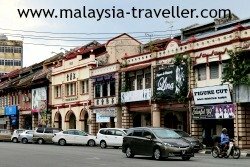 Taiping was one of the first towns in Malaya to be developed by the British and this is reflected in the grandeur of some of its architecture. 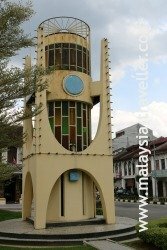 It was the tin capital of Perak until it was superseded by Ipoh. It is town of ‘firsts’. 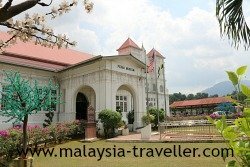 Among others, it can boast the first hill station in Malaysia, Maxwell Hill (Bukit Larut), the first museum, the first prison, the first railway line (from Taiping to Port Weld) and the first English language schools. 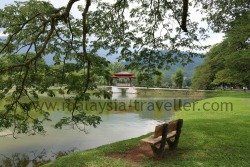 Taiping’s beautiful Lake Gardens, the oldest public park in Malaysia, are, in my view, the finest in the country. 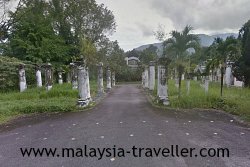 Although crumbling and faded in places, Taiping is a lovely place to visit and has great tourism potential. I have plotted a long list of attractions on this map. Click where shown for the larger version and you will need to zoom and scroll to see all the points of interest. The suggested route for Taiping Heritage Trail covers most of the attractions and if you walk the whole way, as I did recently, it is a tiring, sweaty but worthwhile experience. The trail is 8.8 km long and does not include the more outlying sights such as the zoo, the War Cemetery, Coronation Swimming Pool, Burmese Pool or Bukit Larut. I am starting this Taiping Heritage Trail at Perak Museum. This is the oldest museum in Peninsular Malaysia, having been set up by Sir Hugh Low when he was Resident of Perak. The building itself, which dates from 1883, is more impressive than the contents but it is still worth a visit. You can read more details here. Although Taiping means ‘Everlasting Peace’ in Mandarin it was not always peaceful. 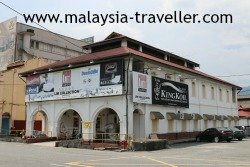 Opposite the museum stand the foreboding walls of Taiping Prison (Taiping Gaol) which was established in 1879 at a time when Chinese gangs running the tin mines were engaged in open conflict and the state was fairly lawless. 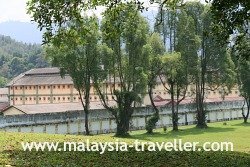 Convict labour helped to build much of Taiping and also ran various trades from within the prison such as a laundry and bakery. It is still an active prison and needless to say is not open to the public but even from the exterior you can see that it is a well preserved example of a Victorian gaol. 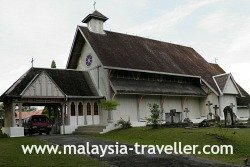 Heading towards the town centre on Jalan Taming Sari we next pass All Saints Church which was the first Anglican Church to be consecrated in the Federated Malay States in 1887. The gothic wooden structure is made of meranti hardwood and its bell tower contains four tubular bells. There is also a stained glass window which was installed in 1911 and somehow has remained intact. Some of the headstones in the graveyard make interesting reading. 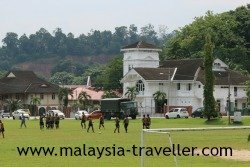 On reaching the Padang, we see a stately whitewashed mansion which once served as the British Officers Mess and is still used by the Malaysian Army today. Also overlooking the Padang is the guardhouse for the barracks of the Malay States Guides with a cannon on its balcony. On my recent visit to Taiping soldiers were playing rugby on the Padang so little has changed in that respect. On Jalan Esplanade on the opposite side of the padang are two Chinese headstones. Here too is a small cenotaph commemorating WWII casualties. 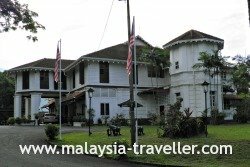 The New Club is not very new at all and is another of Taiping’s historic colonial buildings dating from 1894. Still in use today as a members only club. Atop a small hill (Jelatong Hill) sits a fine house built in 1875 as the official residence of the Secretary to The Resident. It is now the District Officer’s residence. Joggers and walkers can enjoy pleasant views of the Lake Gardens from the path which circles this hill. As for the Resident himself, his official residency was demolished but the foundation pillars can still be found if you follow Jalan Kebab Baru to its dead end up behind the prison. Next on our Taiping Heritage Trail, I suggest exploring the Lake Gardens which have been in use since 1884. This beautifully landscaped park, which is said to have been modelled on London’s Kensington Park and other royal parks in Britain, was created from abandoned tin mines. You could spend many hours in this 64 hectare oasis but if you are pressed for time at least wander along Jalan Taman Tasik as shown on the map and admire the drooping branches of the majestic 100 year old rain trees. Head back towards the town centre along Jalan Maharajalela, Jalan Sultan Abdullah and turning into Jalan Tokong. On the corner here is the former Lido Cinema building, which appears to have been refurbished to be used for other purposes. 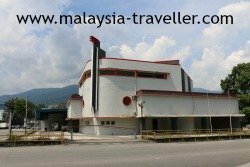 There were once six cinemas in Taiping but all since demolished or converted. Facing the cinema is a godown built in 1925 which used to house the Guan Hin Chan Cigar Factory started by Burmese Chinese in the 1930s using female workers imported from Burma to roll cigars made with Moulmein tobacco. This well preserved building is now used as a furniture shop. 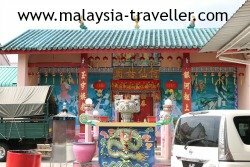 Next on Jalan Tokong is the Temple for the Immortal Girl He, housed in a relatively humble temple decorated on the front with a mural portraying the Eight Immortals. The temple was built in 1887 but has been renovated since. 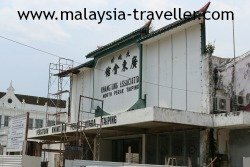 Sharing the same compound is Kwantung (Cantonese) Association which was founded by Kapitan China Chung Keng Kwee and fellow prominent Cantonese in 1887. The building is currently undergoing renovation. 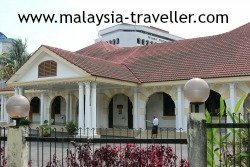 Turning into Jalan Kota towards McDonalds is the Taiping Lending Library which is housed in a bungalow which, when constructed in 1882, was the Taiping branch of Chartered Bank of India , Australia and China (now Standard Chartered). 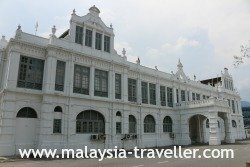 Backtracking along Jalan Kota we pass the imposing whitewashed Government Offices building which was constructed in 1895-98 to provide space for the Council Chamber, Secretariat, Audit, Education and Forestry Departments. It is now occupied by the Larut Matang District Office. Still on Jalan Kota we see the Tourist Information Office housed in a clock tower which in the past has served as a police station and fire brigade. This famous Taiping landmark was built in 1890 and is all that remains of what was a much larger fort-like building. You can find city maps and other tourist information inside. 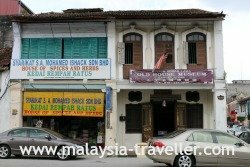 Taking a short detour into Jalan Tupai you can see rows of shophouses including another clan house, the Persatuan Kang Har Tong, a neatly redecorated building dating from 1930. 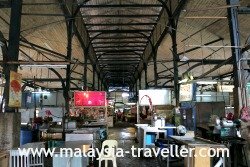 Returning to Jalan Kota we reach the historic central market buildings (pasar lama). Two long barn-like structures, 220 feet long by 60 feet wide they were constructed in 1884-85 using wooden slats over an iron frame. They are still in use today and are well worth a visit if you have a strong stomach and don’t mind the ripe smells. Also on Market Square is the Old House Museum, a lovely old shophouse crammed with antiques. It is run by Mr. Tan Kok Siew who also owns an antique shop in town called Kapitan Antiques House. The good thing about Old House Museum is that many of the exhibits can be purchased. Read more about this place here. You might want to take a break now. You could try the Bismillah Restaurant on the corner here which is highly rated by locals as a place to sample cendol and other delights. 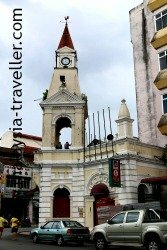 For Part 2 of the Taiping Heritage Trail, click here.